This week is filled with activities that may very well keep me away from the blog world (yours, too, I imagine). So I'm sending a little Christmas fairy to spread some joy your way! Thanks for a great first year of blogging (my blog anniversary happened while we were in Japan)! P.S. I do have at least one amazing cookie recipe I have to make this week, so do check back if you can manage another chocolaty-gingery treat! Now this is a beautiful girl, looks just like her momma. Merry Christmas Julie. 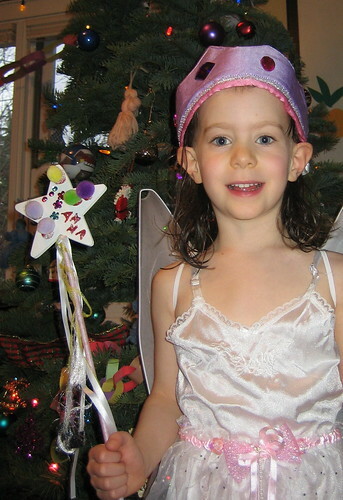 Thanks for sharing your beautiful Christmas fairy with us! I hope you have a peaceful holiday, filled with much love and good things. Love you!